This IBM® Redpaper™ publication introduces IBM PowerVM® Active Memory™ Deduplication on IBM Power Systems™ based on IBM POWER7® processor technology. Active Memory Deduplication is a virtualization technology through which memory pages with identical contents can be deduplicated in physical memory. This deduplication frees up physical memory positions so that more data can be held in memory at once. Memory deduplication is intended to work in a shared memory environment. Deduplication works with Active Memory Sharing, a technology through which multiple partitions on a system can share a pool of physical memory. Sharing this pool sometimes creates an overcommitment of this physical memory. Active Memory Deduplication increases the performance of Active Memory Sharing because the savings can be used to lower memory overcommitment levels. Reduction of memory in use can also create room to increase the memory footprint of the logical partitions (LPARs). This paper describes the advantages of Active Memory Deduplication and requirements for its use and implementation in your Power Systems. 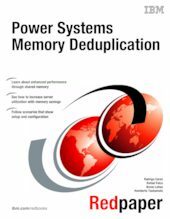 This paper also helps you set up Active Memory Deduplication on your Power System for use with IBM AIX®, IBM i, and Linux. It includes guidance for tuning parameters of Active Memory Deduplication and for troubleshooting issues. This paper targets architects and consultants who need to understand how Active Memory Deduplication technology works to design performing solutions. The paper also targets technical specialists in charge of setting up and managing Active Memory Deduplication.